Astronomers have discovered a gas giant planet the size of Jupiter circling a star half the size of the sun—a combination, which current theories of planetary formations would say was impossible. Astronomers at the University of Warwick describe the new star and planet in an article to be published by the Monthly Notices of the Royal Astronomical Society. The giant planet, named “NGTS-1b,” is a gigantic 986-degrees-hot ball of gas revolving around a red M-dwarf star 600 light years from Earth. It is the largest planet compared to the size of its star ever found. Small stars, according to the currently accepted theories of planet formation, can only produce small rocky planets. To make it even odder, NGTS-1b orbits extremely close to its sun. The giant planet is less than 3 million miles from its sun. By comparison, Earth is more than 92 million miles from its sun. Also, NGTS-1b orbits its sun in 2.6 days. The Earth, of course, takes 365 days to complete a solar orbit. If that is so, a large part of current astronomical theory will need revision. NGTS-1b is the first planet located by the Next-Generation Transit Survey (NGTS), which uses a 12-telescope array to scan the sky. The array scans the night sky looking for tiny rhythmic fluctuation in light from stars, which could mean that a planet is coming between the star and the telescopic array. By timing the fluctuations, scientists determine the period of rotation. Once a planet is spotted, scientists can analyze the “wobble” of the star—tiny changes in the star’s rotation—which indicate the mass of the circling planet. The NGTS array is run by a coalition of universities: U.K. Universities Warwick, Leicester, Cambridge, and Queen’s University Belfast, plus the Observatoire de Genève, DLR Berlin, and Universidad de Chile. The array is located in the Atacama Desert in Chile, at the European Southern Observatory’s Paranal Observatory site. Wheatley, who leads NGTS, was pleased by his team’s results. 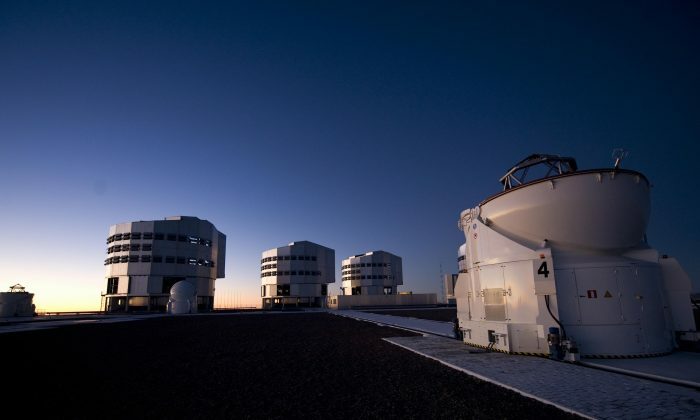 “Having worked for almost a decade to develop the NGTS telescope array, it is thrilling to see it picking out new and unexpected types of planets. I’m looking forward to seeing what other kinds of exciting new planets we can turn up,” he said. ALMA, the world's most powerful telescope, produced a one-of-a-kind image of a system giving birth to planets.